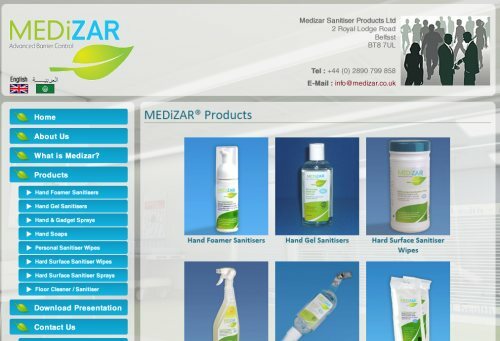 Medizar is a new range of sanitising products aimed mainly at the healthcare industry. The product range includes person hand sprays and wipes, floor cleans, surface wipes and sprays and a range of soaps. The product will kill 99.9999% of harmful and deadly bacteria and viruses including Legionella, Norovirus, Listeria, E.Coli, and Salmonella. Because the product is alcohol free it has been certified by the HMC (Halal Monitoring Committee) and can be used in the middle east where alcohol based products would be banned. The site comes in two different translation versions, English and Arabic and provides full details of the product and a presentation in PDF format.